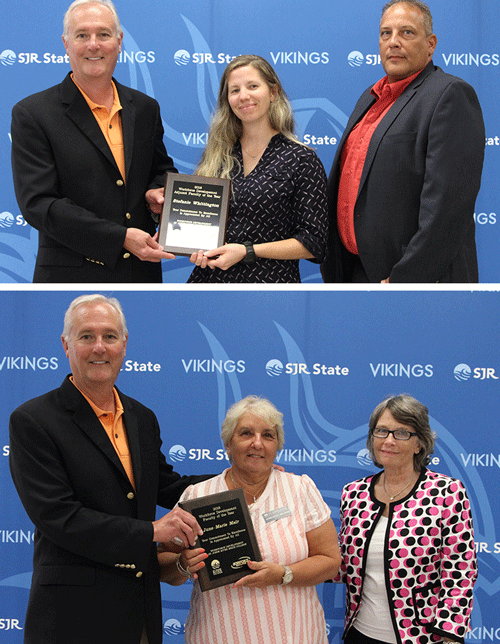 St. Johns River State College recently presented its Workforce Faculty of the Year awards for 2018. Nursing instructor June-Marie Mair was named faculty of the year and criminal justice instructor Stefanie Whittington was named the adjunct faculty of the year. According to Vice President of Workforce Development Anna Lebesch, "Faculty nominees exemplify individuals who are dedicated to the SJR State mission and meeting the needs of Workforce Development. These individuals have demonstrated their dedication to students, to their program and to the College, going above and beyond to serve our students and the community. We appreciate their dedication and service to SJR State." Mair joined the college in October 2013 and had previously announced her retirement for May 2018. "But seeing that she had one more thing to accomplish to serve her students, she postponed her retirement until December of 2018, so that she could teach in the practical nursing program and see our first class of students graduate in December," Lebesch said. According to Lebesch, Whittington teaches forensics, criminal investigation and recently developed a new death and injury investigations advanced course. "As an adjunct, she is active both inside and outside the classroom, engaging in curriculum development and assessment activities, as well as creating a robust online coursework to support the study of forensic science," Lebesch said. "She is a highly respected leader in her field who brings her professional expertise to our students. When she is not working for us as an adjunct, her full-time position is with the St. Johns County Sheriff's office as a supervisor in the crime scene unit." Top photo: Criminal justice instructor Stefanie Whittington receives the 2018 Workforce Development Adjunct Faculty of the Year Award from President Joe Pickens, J.D. (left) and Dean of Criminal Justice and Public Safety Jeff Lee, Ph.D.
Bottom photo: Nursing instructor June-Marie Mair receives the 2018 Workforce Development Faculty of the Year Award from President Joe Pickens, J.D. and Dean of Nursing Diane Pagano, D.S.N.